Secret Valley Of Great Kings which has a few more performances at the Bat Centre is written, produced and directed by Menzi Mkhwane. It is set in North West Africa during an almost prehistoric era and tells the story of a young girl named Kotso who is born in a small tribe called Khigubhu during a time of war. In an impressive sequence, sound effects created the sound of a strange gigantic fiery rock which crashes and destroys a sacred mountain. This stops the war that has been consuming the continent for many years and the reason behind it is unknown. All the elders have mysteriously disappeared, all the mothers, fathers and grandparents and great parents are all gone. Only the children are left behind. One of these children is Kotso. We meet her at the start of her desperate but determined decision to travel to the last empire; Malugueta, with her baby boy Mashariki. Her need is to visit the last living diviner, Naomi, to discover Mashariki’s ancestral destiny. However, the journey is not without major challenges. Also giving notable performances in the fight scenes as the warriors were tall and muscular Nkanyiso Mazibuko (Eediyas) and Sabelo Jili (Acacia). Other good performances came from Nqobile Masondo (Kivu) and Mthunzi Mhlongo (Turu). Mkhwane also appears in the production himself and creates much humour as Nima, the fussy court official. Sphe provided background sound on a djembe. The North Western musical pieces were designed by Aphiwe Namba. Mkhwane acknowledges this show as “perhaps the most enchanting, challenging, exciting and mind-expanding experiences of all the plays I have ever assembled”. With its 10-member cast, it is also the biggest play he has put together. 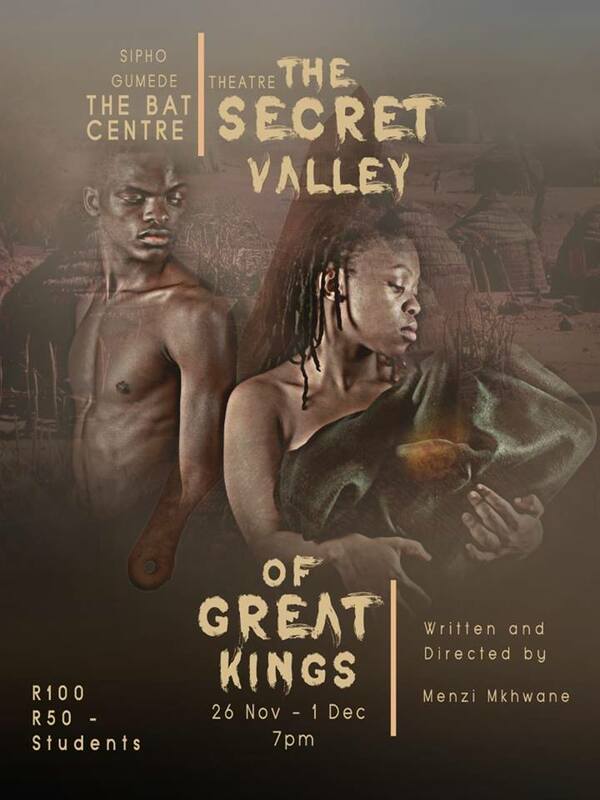 Mkhwane describes Secret Valley Of Great Kings an epic theatre thriller and it certainly takes its time to tell its story – running for about an hour and 20 minutes. The Sipho Gumede Theatre is a useful performance space with bench seating and a few rows of chairs. I was highly impressed with the cast’s physical energy throughout – in fight scenes, tribal rituals and particularly when they rushed full-tilt down the stairs onto the stage from the theatre entrance. My main problems were difficulty in hearing the actors using the West African accent as well as audibility when they continued to speak while turning upstage. This was also a problem when they were accompanied by the djembe or mbira. The production deals a lot with spirits but the technical limitations of the theatre don’t allow for sophisticated lighting and there were times when I would have loved to have had specialised lighting for the ghostly scenes, particularly those that involved the diviner. However, all congratulations to Mkhwane for his continuing persistence and dedication to providing more theatre for Durban audiences and his new production company deserves to be supported, also for incorporating into this play a strong message of brotherhood and peaceful co-existence. Secret Valley Of Great Kings runs until December 1, 2018, in the Sipho Gumede Theatre (Bat Centre) at 19h00 each night. Tickets R100 (R50 students) at the door.